While driving back and forth from the restoration shop, where my old muscle car was being reassembled, I kept seeing an old, abandoned house sitting in the middle of a field, where new houses were encroaching at an alarming rate. 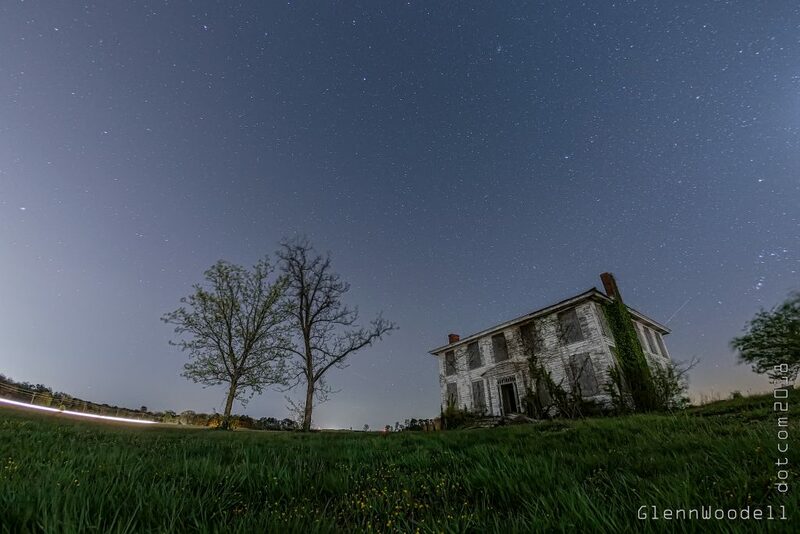 I had ideas of shooting this house at night, against the star-lit sky. But being 30 minutes from my house, in a direction I rarely travel except during the day, of course I kept forgetting about it. That was more than a year ago. Finally, after seeing some of my photo-friends post shots of the Milky Way from the North Carolina Outer Banks, I decided I had to get the shot while the scene still existed. It was chilly and windy but the skies were clear. Perfect for getting a dark sky with some surrounding light effects. The crescent moon was nearby. Bright enough to illuminate the house but too high in the sky to be able to see the majority of celestial ecliptic, so I decided to keep it just out of view. I loaded up the 1Dx with my trusty 15mm fisheye and set it at f4 since I knew it would be a challenge to focus against a dark sky and a house with very little contrast. I started with an ISO of 1000 and bracketed by 2/3 of a stop at five shots to figure out where I wanted the final exposure to be. This final shot was at 30 seconds and includes a few aircraft traces, lights from neighboring communities, and traffic along the highway. I don’t know how much longer this house will be standing, or when the neighboring houses will destroy the beauty of the scene, but for now it is etched in my mind and in the digital world. Well said Jerry (and Jeff) and thank you for the kind words, from the local master of landscape.